Garden fresh corn, sweet bell peppers, tomatoes and some red onion, combine with a sweet and sour vinegar and oil dressing for a wonderful summer salad! As far as fresh veggies go, I've sure been enjoying my garden tomatoes This is the first year that I've not had an abundance of fresh green beans and fresh peppers though. The peppers are way behind thanks to those pesky aphids, and while a couple of them do have some blossoms, the heat is pretty rough on them here lately. Maybe now that July is here we'll start getting some more regular rain to help with that. I guess the trade off is that this year, unlike last year, I have had a lot of tomatoes and cucumbers, so I'm happy about that! Right now is the perfect time of the year to find some great super sweet corn at the farmer's market, or at the very least, in the grocery store, so by all means, although canned works great, use fresh if you've got it! You can grill it, roast it in the oven, or boil it, which is my most favorite way to eat it, slathered with pure butter or a nice compound butter blend, and of course, a nice sprinkle of kosher salt. 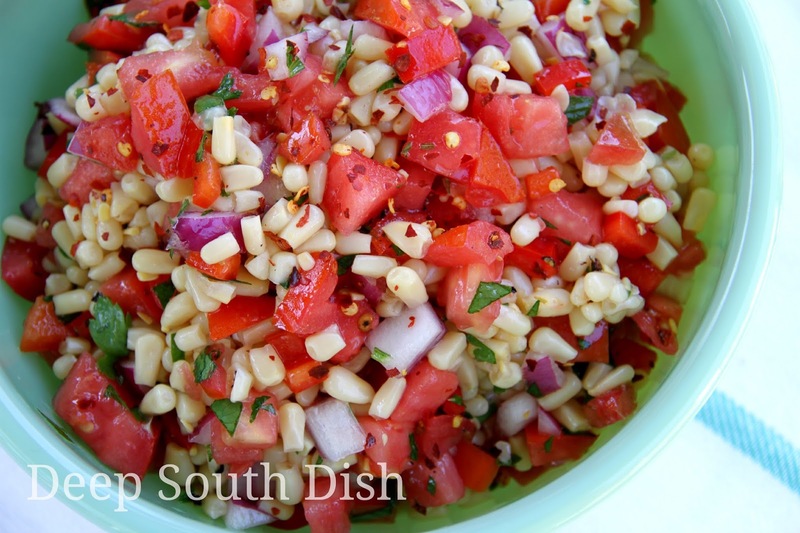 But, why not enjoy it in a salad, in some Mississippi Style Texas "Caviar," or better yet, as a salad, like here, and here it is especially good when made with grilled corn. You can serve this all on its own for a light meal, as a side dish, or use it as a salsa type dip for tortilla chips. Let it marinade for a couple of hours in the ever popular Southern blend of sweet and sour dressing, and you've got a fresh, yummy, summer salad that's pretty healthy. Yeah, on occasion I do that. Here's how to make this fantastic Marinated Corn Salad. By the way, canned or frozen, thawed corn works very well for this salad. My favorite is LeSueur shoepeg - the cans are smaller so you'll want about 3 of them, though you can get by with two. If using regular whole kernel corn, drain off excess liquid, but use shoepeg undrained. If you can get your hands on some fresh Silver Queen, that is the absolute best for this marinated salad, in my little ole opinion. It's hard to come by here in South Mississippi unfortunately, which is why I adore the canned shoepeg. Cook fresh corn, white, yellow or bi-color, crisp tender, according to your favorite method. I usually boil it but have, for the last few years, been using that really cool, no husk microwave steamed method. It's so easy and works fantastic. In a large bowl, whisk together the vinegar, olive oil, sugar, salt, pepper and red pepper flakes until well blended. If you are using a canned corn, check the label for salt and sugar before adding any and adjust accordingly. Let the corn cool then strip it from the cob and add to the dressing. Of course if you're using canned corn, no cooking is required. Simply add it to the dressing. I LOVE having an herb garden right outside the back door & have had one for years. Even if you grow in containers on your back porch or deck, I hope that you'll consider starting an herb garden with the herbs that you use the most. I usually keep mint - in a pot since it's rather invasive - rosemary, parsley, chives, basil and dill, at minimum. There's such satisfaction about walking out your back door to clip off a handful of fresh herbs y'all! Top the corn with the onion, bell pepper and parsley. Toss, taste and adjust seasonings as needed, especially for salt. Refrigerate for a minimum of 2 hours, stirring occasionally. Cook fresh corn, white, yellow or bi-color, crisp tender, according to your favorite method. Drain, return corn to pot and cover with cold water. Set aside until cool enough to handle. In a large bowl, whisk together the vinegar, olive oil, sugar, salt, pepper and red pepper flakes until well blended. Remove the corn from the cob and add to the dressing. Top with the onion, bell pepper, tomatoes with their juices and parsley. Toss, taste and adjust seasonings, especially the salt. Refrigerate for a minimum of 2 hours, stirring occasionally. Cook's Notes: This can be served as an accompaniment, as a salsa with chips or as a side dish. Great with summer BBQ, burgers, or any Tex-Mex type of meal. Toss some in with your favorite pasta salad too! Use local fresh corn when it is in season and at peak during the summer months, but when not available, substitute 2 cans of whole kernel corn, drained or 1 (10 ounce) package of frozen corn, about 2 cups, thawed. I love this with LeSueur canned shoepeg corn - use 3 cans, undrained. Check canned products for sugar and adjust added sugar accordingly. Also excellent with grilled corn. Add a (15 ounce) can of black beans, drained and rinsed. Can also substitute commercially bottled Italian dressing, if desired. Lol, I do the SAME thing BJ! I'm glad that you enjoyed it as much as I do!! Thank you for an easy and delicious recipe. I am making it this week-end for our family reunion. I am going to triple the recipe for that crowd.